by Joseph E. Pogue, Ph.D.
Yale University celebrated the 150th anniversary of its Peabody Museum of Natural History in style, with the October 23 public debut of the David Friend Hall, which we announced in June. The hall features more than 150 world-class mineral and gem specimens from some of the greatest collections in the United States. Both large-scale and smaller minerals are on display. For more information, see this news release and the Yale Peabody Museum of Natural History website. Our friend Eloïse Gaillou, Associate Curator of Musée de minéralogie MINES ParisTech, tipped us off regarding a current exhibit at the museum, a stone's throw from the Sorbonne. Master jewelry artist Paula Crevoshay presents "Illuminations: Earth to Jewel," which pairs her own creations with gem crystal specimens from the museum's holdings. Many of Crevoshay's jewels contain floral themes, so it's appropriate that she is exhibiting directly across from the Jardin du Luxembourg. Eloïse told us, "The gemologist community is well aware of the exhibit, but not the mineralogical community…. It's a shame, as we present both rough and jewelry." The exhibition is presented in both French and English. For those who can't attend, see this visitor's guide (in English and in French). Pendant in rutilated quartz and tanzanite by Paula Crevoshay, and tanzanite rough crystal in the collection of the Mineralogy Museum. The "Portuguese Man of War" jellyfish by Paula Crevoshay is made with play-of-color opal, chrysocolla, sapphire and coral. On the right, a specimen of chrysocolla from the Democratic Republic of Congo in the collection of the Mineralogy Museum. Illuminations: Earth to Jewel is the title of the accompanying volume created in conjunction with the exhibition. It features text by Paula Crevoshay and Christopher Chavez, a foreword by the Musée's curator Didier Nectoux, and an introduction by Martin Bell. After the holidays, we're looking forward to the world's greatest gem and mineral show in January and February. One-stop general information about individual shows, shuttle routes, and more can be obtained from the Tucson EZ-Guide. The event website features an interactive floorplan allowing you to see who is exhibiting by area of the convention center. Free seminars by notables in the world of gemstones and pearls are listed. Also listed are several special events and exhibits. The American Gem Trade Association (AGTA) is an association of United States and Canadian trade professionals dedicated to promoting the long term stability and integrity of the natural colored gemstone and Cultured Pearl industries. The Association pursues its goals through the combined use of educational programs, publicity, industry events, government and industry relations, and printed materials for both the trade and consumer. See Pala International's page on the Westward Look Show site. See also this dealer list. The annual Saturday Collector Day this time will be devoted to the collection of the Rice Northwest Museum of Rocks and Minerals. (See our December 2014 writeup on the museum.) The annual Sunday Evening Program is yet to be announced. 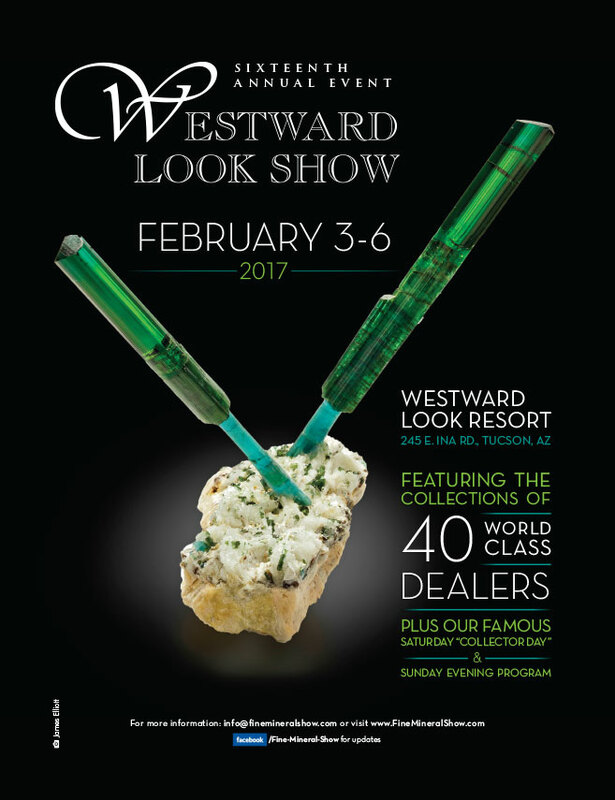 Christophe Gobin shares some of his great mineral specimens at last year's Westward Look Show. TGMS is the largest gem and mineral show in the country. This year's theme is "Mineral Treasures of the Midwest." For everyone who came to the 2016 Tucson Gem and Mineral Show® and would like to revisit some of the spectacular exhibits, and for those of you who weren't lucky enough to attend: For your viewing pleasure, the Tucson Gem and Mineral Society and BlueCap Productions present this video, comprised of six of our "Spotlight Cases" that were in the 2016 Tucson Gem and Mineral Show®, "Shades of Blue – Minerals of the World." This month we feature a malachite and azurite from south of the border that seems to take on a symbolic holiday form of (all) sorts. The evergreen mass is a fibrous chatoyant malachite. Dangling from the bottom left are four main azurite clusters: pristine well-formed crystals that even show some transparency. The rest of the specimen has then been magically hung with spherical pyrite ornaments from China and topped with a complex penetrating spinel twin from Burma. A dazzling array for the season upon us. Visitors to, and residents of, Southern California have a lot of museums to browse. Lovers of minerals and gemstones—and art—can whet their visual appetite by visiting just one institution: the GIA Museum in Carlsbad. Variations on a Theme: 25 Years of Design from the AJDC celebrates the silver anniversary of the American Jewelry Design Council with 150+ examples of work created for the nonprofit's annual themes. Perry Davis's gem and mineral sculptures have intriguing titles like Ice Tree and Tao of Rutile, and the carvings themselves show off the materials' compelling qualities. The myth of the Dragon King's Daughter is told in painstaking detail through a (pre-ban) elephant ivory carving featuring an orb composed of thirty-eight (!) concentric spheres. And contemporary art aficionados will enjoy Visions in Crystal, created by third-generation Idar-Oberstein gem cutter Tom Munsteiner, whose six-foot-tall sculpture is composed of 264 rock crystal quartz tiles that each shimmer, and together create a larger pattern. The Museum's newest objects are ornamental minerals from a sixty-three-piece donation by the family of Joel and Barbara Hauser, fifty of which are currently displayed. We received the following news item from GIA on November 9. GIA's museum has acquired 63 ornamental minerals of exceptional size and quality, made possible through a generous donation by the family of Joel and Barbara Hauser. Many of the pieces are from localities with restricted access or that are no longer producing. These will serve as prime learning tools for students and visitors to GIA about mineral formation and lapidary artistry. Nearly 50 of these minerals are on view at the Institute's Carlsbad museum. For more than 60 years, native Californian Joel Hauser ardently pursued his hobby of collecting agates, geodes, ornamental minerals and petrified wood. His decades of devotion culminated in an impressive and celebrated mineral collection. On one trip in pursuit of mineral marvels, he unearthed a deposit of agate geodes in Riverside County’s Little Chuckawalla Mountains, known today as the Hauser Geode Beds. Hauser was also a skilled lapidary, mastering the art of contour polishing. "His freeform, undulating polishing style adds interest and texture while removing blemishes, without having to grind away more material than necessary. Joel's expertise, guided by an artistic eye and perspective, revealed the lovely patterns, markings and colors in the minerals," says Terri Ottaway, GIA's museum curator. Hauser also designed and modified saws and grinding equipment that could handle the cutting and polishing of even large pieces of petrified wood. His wife Barbara and their four sons have donated the collection's finest ornamental minerals to GIA in his memory. The significant acquisition helps the Institute fulfill its mission to educate and inspire students and the public about gems, gem minerals and jewelry. The GIA Museum is open to the public by appointment only, Monday through Friday. With Pala Presents, we offer selections from the library of Pala International’s Bill Larson, who shares some of the wealth of information in the realm of minerals and mineralogy. Joseph E. Pogue Jr. in 1906. Joseph Ezekiel Pogue Jr. (1887–1971) was a geologist, petroleum engineer, and economist, receiving his doctorate in geology from Yale in 1909. That same year he joined the Smithsonian as assistant curator until 1913, spending 1911 as a special student at the University of Heidelberg. He joined the faculty of Northwestern in 1914 after a year with the U.S. Geological Survey as associate geologist. Leaving Northwestern in 1917, he returned to the Smithsonian as mineral technician. The next year he became assistant director of the Bureau of Oil Conservation for the U.S. Fuel Administration. According to his NCpedia profile, his career remained in the field of petroleum. Mineral and gemstone enthusiasts will be interested in his monograph The Turquoise (1915) as well as the present paper, The Emerald Deposits of Muzo, Colombia (1916). This latter study is a readable text, helpfully illustrated. Part 1, which we present here, covers the Muzo emerald deposits' location, history, and general and detailed geology. Part 2, in our next edition, covers minerals, age, origin, mining methods, and production. As promised in our last edition, we look at a brochure created by John W. Ware. In 1923, San Diego jeweler and gemologist John W. Ware issued a trifold brochure touting the city, its county, and the area's mineral treasures—"The Gem Casket of America." Ware begins by focusing on the geology of the region, then lists eight local gemstones and their gemological properties, before singing San Diego's praises in an eight-stanza poem of his own composition. The poem encapsulates some of the features of San Diego contained in a thirty-two page booklet issued by the county's Board of Supervisors in about 1907, which we featured in our last edition. As you know, we bring mineral news to our subscribers (and website visitors) every other month via Pala Mineralis. But at the same time, we also post a bimonthly Featured Video on our Home page. Our current offering is Paula Crevoshay's introduction to her Paris exhibition "Illuminations: Earth to Jewel."